A Los Angeles restaurant featuring the celebrity chef makes diners feel at home and far, far away. Confetti-like ceviche, chocolaty mole the color of midnight, and a cochinita pibil made from tortilla-fed suckling pigs: This is the signature Mexican cuisine of Rick Bayless, the Chicago chef whose empire ranges from cookbooks to television shows. Bayless’s Topolobampo and Frontera Grill have been name-checked as favorites of the Obamas–he recently went to the White House to cook for a Mexican state dinner–but for the most part, his restaurants hadn’t yet ventured outside the Windy City, making the stakes extremely high for Red O, a Los Angeles eatery with Bayless’s menu that opened in May. Even before Bayless was attached, investors had planned for a high-end Mexican restaurant, tapping Dodd Mitchell Design, known for its clubby dark leather and water-and-fire interiors in celeb dens such as the Hollywood Roosevelt Hotel. Principal designer Gulla Jonsdottir, who has also worked for architect Richard Meier, took on the project at the firm, then left to start her own practice during the process. For inspiration, Jonsdottir looked immediately to the cliffs of Los Cabos, Mexico, and its white-walled stucco and breezy beach cafes. The space’s most dramatic feature is a giant cage-like trellis that wraps around the building’s exterior. “It’s supposed to represent a wrapped present, says Jonsdottir. “Sort of like a gift from Mexico to L.A.” The ribbon in this case is made from 26-foot high powder-coated dark bronze steel which hugs the building, lending light and shadow to the interior space. Another star feature of the space: A three-story courtyard with 26-foot white walls reaching skyward, ringed in fabric screens and crowned with shimmering chandeliers. For L.A.’s evening chill and few rainy days, an automated glass roofing system slides closed, effectively creating a massive skylight. Large garage doors fronting the courtyard also open to the inside of the space, allowing natural light in during the day, but also a resort-y indoor-outdoor feeling in the evening. At the center of the space, a palm tree, which was outdoors before the renovation, was left in place as the patio was built around it. Making the space feel cozy but escapist was another of Jonsdottir’s goals–the sense of getting away. “Most of the furniture is custom-designed to be exactly that, very comfortable and welcoming–like you are sitting at your best friend’s house in Mexico on the beach,” she says. Cushy sofas and comfy chairs from Janus et Cie are piled high with cushions. Niches are carved into the walls, like the curved alcove spaces seen in Mexican architecture, for more private dining, and a 25-foot fireplace provides a warm, hearth element to the front bar. Even the wooden roof of the former restaurant was left pretty much as-is, whitewashed and exposed, giving a homey feeling to the space. L.A. metal artist Scott Brown, who created a cascade of roses for the bar, and Mexican artists created giant chalk-brushed terra-cotta planters which serve as space dividers. Handmade leather swings lazily sway at the bar. And of course, no one’s forgetting the tequila, featured here in a “tequila tunnel,” a curvaceous, glowing, glass-walled transition from the lounge to the restaurant which features reposados and anjeos lined up like tropical fish in an aquarium. This is Jonsottir’s favorite moment, watching people appear dazzled as they step from the cave-like space into the dining room. “They experience a sense of discovery when moving through a low-ceiling, narrow space and emerge into an open, high-limit space as a three-story-tall outdoor atrium.” It’s almost like the feeling you get as you step onto a wide, sandy Mexican beach. Design brief: Custom furniture and accents arranged in an open floor plan, enabling one to survey it in its entirety from almost any spot in the restaurant, with each space flowing seamlessly to the next. 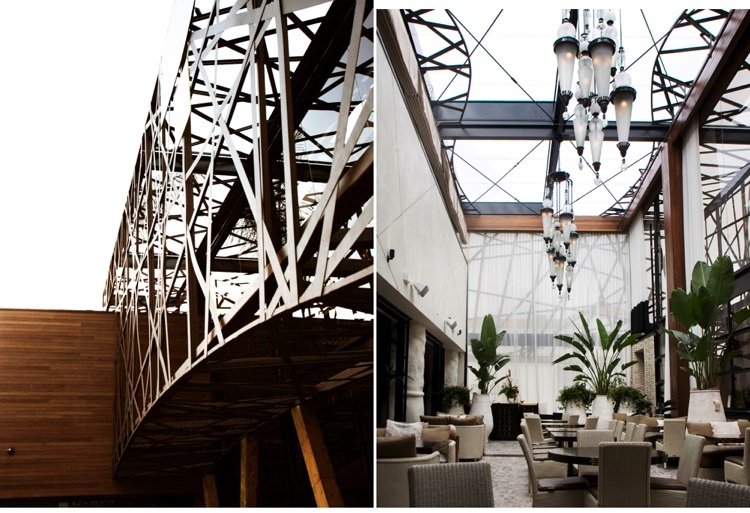 Design highlights: A dining courtyard, crowned by two 14-foot chandeliers hand made by Mexican artisans. A 14-foot communal table made of solid walnut and bronze sits in the main dining room. Across the room, a sofa-style banquette sits underneath a wall adorned with over 400 brass bells, with a semi-private dining room tucked into another corner. 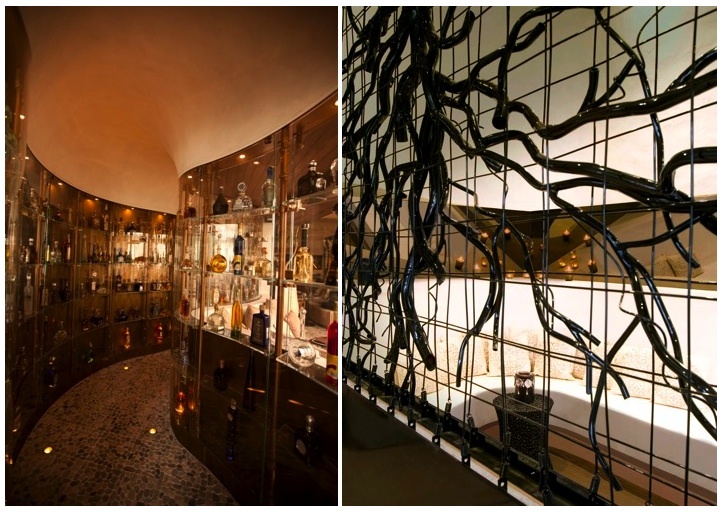 Special features: A distinctive glass tequila tunnel, showcasing an extensive selection of premium spirits, winds from the dining room to RED O’s Tequila Lounge. Here, guests can sit at the bar made from boulders underneath the canopy of a palm tree, adjacent to a small pool filled with floating candles, or next to the 25-foot fireplace with a view of Melrose Avenue through its glass backing.